It has become widely accepted, that content arranged in list form is quicker to find, easier to remember, and more actionable, which makes lists ideal for sharing content as part of a highly effective content plan. Moreover, humans seem to be innately drawn to them (as discussed in the book Inbound Marketing, by HubSpot’s Halligan & Shah). When groups of people use numbered lists as the glue that joins them together, it can magnify the impact and reach of all their content efforts. The same holds true when creating a numbered list to promote a contest or conference — promoting and building buzz around an event via lists can save time and cost. In addition, these lists can be used to draw the attention of subject matter experts, or can be used as consumer research on the content your audiences are looking for. Content marketers can also build credibility by strategically creating original lists, as well as by adding to the lists of others. This article will demonstrate how four different numbered list-based content plans have worked to help organizations reach their marketing goals, including attracting and engaging customers, and growing their businesses. As a note, all the examples provided below use Listly lists, though some of the efforts described can be created using other list processes. Creating a community of like-minded individuals, enthusiasts, or professionals can extend the reach of each individual member’s content. Twenty Microsoft SharePoint consultants did just this — they decided to band together to promote their passion for the platform via a collective entity. A community of SharePoint partner sites. In late January 2013, the group members decided to embed a list of resources on their individual blogs. 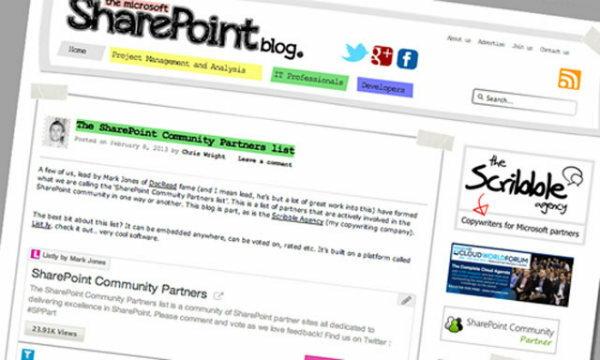 Each member received a SharePoint Community Partner badge to display on his/her blog’s front page, which links to a Community page that contains the complete embedded list of members. An embedded list on a SharePoint consultant’s blog. Consider adding an element of gamification into your list strategy. For example, the SharePoint community awards the partner who earns the most views from his or her embedded content by featuring him or her at the top of the following week’s list. The SharePoint Community has synchronized its own Twitter list of members with a Listly-based Twitter list, so the whole community can recommend people to follow on Twitter, and both lists will be updated with the relevant information. This helps community members find more people with which to share relevant content. The number of lists the SharePoint community shares has grown to 60 and includes things like SharePoint slides lists and SharePoint blogs lists. In addition, the number of blogs crowdsourced via this project has reached 90, and this collective action has helped SharePoint’s content get seen and shared by more people across its extended community. This original SharePoint list earned more than 24,000 views (this is the combined stats of Listly views and the views across all the blogs). The SharePoint Community’s content consistently ranks highly for multiple search terms, providing increased search visibility to all participants. The SharePoint Community attracted 1,200 members from around the world in the first 11 weeks after launch, greatly exceeding the expectations of the SharePoint Community’s founders! 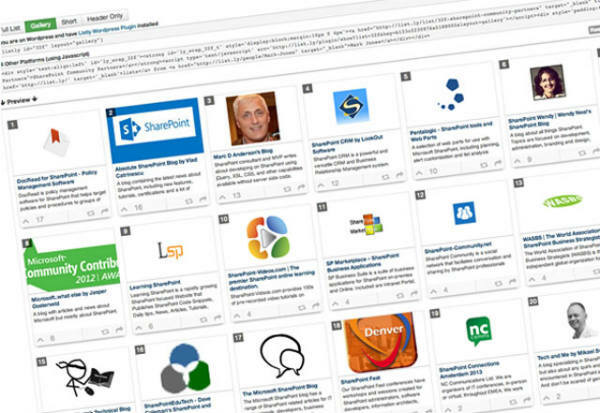 Lists created by the SharePoint Community on Listly have been viewed over 70,000 times. Contests are all about creating awareness for a business or company brand, and creating exposure for the participants. Designing contests around lists helps both in attracting, and flushing out people who are passionate on your topic, helping you find an engaged, focused target audience. GSummit runs multiple contests to source and acknowledge the best examples of gamification in the workplace — they focus each contest on a specific content niche (or domain), such as Human Resources, Start-ups, Enterprises, Education, Hospitality, and Health & Wellness. Each time it runs an event, GSummit creates a unique list of content on Listly for each domain, and seeds that list among a few possible candidates. The candidates then embed these lists on their blogs, along with the rules and expectations of the contest and the contestant’s branding, and invite others in their own networks to engage. GSummit embedded the “Best Use of Engagement Techniques in Human Resources (HR)” list in their blog. The GSummit model is easy for anyone engaged in a contest to replicate, providing a way to share content, showcase themselves (or their company), and attract votes. It’s an efficient and engaging way of putting crowdsourced content in front of your audience, and distributing it across multiple online locations both before and during an event. GSummit has run three sets of contests using Listly lists, driving a combined total of 132,000 views across Listly, its own website, and the sites of participating brands. Crowdsourcing the promotion (marketing and advertising) of its events to its contestants helped save GSummit considerable time and money. Creating the buzz ahead of a conference attracts more attendees, while buzz during a conference attracts press and/or attention online, building momentum around the conference for the participants and the outside world to see. The buzz after a conference often magnifies the benefits, motivating the continuation of the engagement and networking started at the conference. Consider the case of Tomorrow’s IT Service Future Today’s 2012 conference (TFT12), the first 24-hour global ITSM virtual conference. Speakers were asked to make their submission following precise instructions to include presentation title, synopsis, biography, and preferred time zone (EMEA, Australasia, US). The top 24 speakers for the event were chosen for their popularity, as voted on by the community on the Listly list. Top speaker Rob England received 60 votes. This list participation created enormous pre-conference buzz and engagement as a result of the speakers adding themselves to the list, promoting themselves and the conference, and adding to this the voting by others. Distributing dynamic lists of conference speakers can extend the reach of the speakers’ insight, as well as serving as a way to curate their content for viewing after the conference, or to allow people who were unable to attend the conference to benefit from the subject matter. The ability for audiences to engage with conference speakers through lists is a great way to build buzz for your organization’s upcoming events. Consider creating a list of your attendees ahead of your event, which allows people to prioritize how they should network, as well as how and what content they will likely want to share before, during, and after the event. The Listly list of speakers for the TFT12 conference received more than 23,000 views. The TFT12 Listly list of speakers was accessible to anyone, which helped to add buzz around the actual conference (everyone was able to follow the conference as it was happening). After the conference, 12 of the 24 listed speakers gained more prestigious and more lucrative jobs (a direct result of their contributions to the conference). 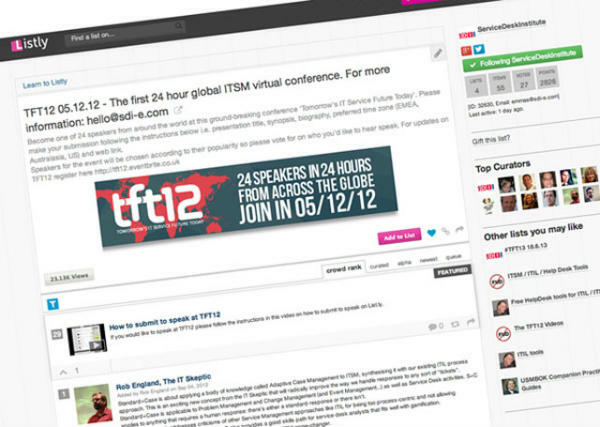 TFT13, the second online virtual 24-hour conference, was held on June 18, 2013. The speakers were crowdsourced on a Listly list — just as they were for the previous year’s event. The list allowed potential attendees to easily see who would be contributing to the conference ahead of time — and based on this benefit, the 2013 event was able to rapidly attract an impressive roster of paying sponsors. Why flush out the experts? It helps others to make more informed decisions if they have a list of experts they can communicate with and solicit information and advice from. It also creates a target list for research, marketing content, or crowdsourcing — helping your audience members find exactly the expert and/or content they need, when they need it. Moreover, it helps bring you, as the list creator, to the attention of those experts — you become an expert on the experts! Every category, focus area and industry has its experts — from doctors on Twitter to authors who blog; business consultants who contribute lists of questions for entrepreneurs to speakers at a conference. For example, this list of doctors on Twitter started through the contributions of more than 80 medical practitioners, quickly grew to include 243 medical professionals. Design a strategy for creating lists. With your overall content marketing strategy in mind, create something that enhances your content, credibility, and visibility, and is of course helpful to others, while inspiring them to engage and add to your lists of content. Promote it on several online platforms. Schedule your list-making activities to fit your strategy. An active blogger could choose to embed a list in every blog post to drive traffic, or just one a week on a very focused topic related to his or her business expertise and content marketing goals. Remember to promote your (and others’) lists on your social media platforms, including Twitter, Facebook and G+ communities. 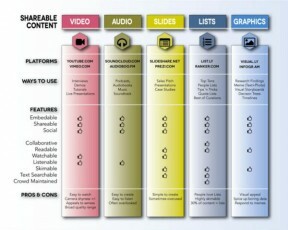 Creating and sharing lists of content is a viable and efficient option for content marketers. Lists are not a new technique by any stretch of the imagination; however, with the tremendous growth in the amount of content being consumed and shared in recent years, lists have become a vital component for helping your content achieve optimal reach and impact. Want more inspiration on using lists to extend the conversations happening around content marketing? Watch for the Listly lists that will be leveraged at Content Marketing World 2013. Caroline (Casudi) Di Diego is a social media whisperer inspiring brands and communities to find their social voice via new media. Casudi has 25+ years of experience helping grow companies from concept/chaos to fundable and profitable. She is the creator of the successful Entrepreneurs Questions EQlist.